The concept of “transmission” by means of an “authentic” and “unbroken lineage” plays a pivotal role in Vajrayāna Buddhism, since it is regarded as the chief means by which the realizations of past masters are said to remain accessible in unadulterated and undiluted form right to the present day. The “transmission” of a set of associated meditative practices is “authentic” when its formulation originates from a Buddha, somebody—in fact anybody—who has overcome all and every cognitive obscuration and emotional defilement and therefore knows how to help others achieve the same feat. A lineage is “unbroken”, when this set of practices has been passed without interruption to exceptional students, who, in turn, cultivate and “realize” the instructions fully, and in reaching the same attainments as their tutor, thereby become the next “lineage holder” entitled and able to transmit the meditation practices received to the next generation without any loss of potency. If we employ the term “lineage” as it features in Western languages, we may also refer to the different “reincarnation lines” of outstanding practitioners, or “Tülkus”. 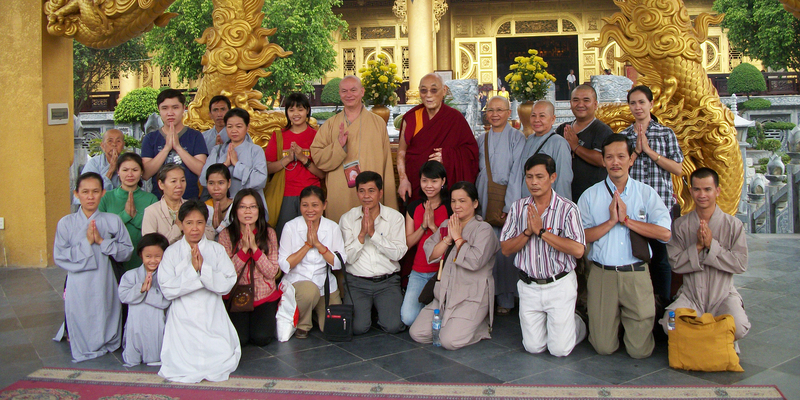 These are exceptionally advanced practitioners, who due to the heightened clarity of perception gained through prolonged meditative practice, are able to predict the specifics of their next birth, and choose to relate them to their inner circle, so that the transmission between student and disciple can be upheld in future lifetimes. Historically, the first instalment of such a “reincarnation line” has been the recognition of Karma Pakshi (1204–1283) as the previous “Black Hat Lama”, Düsum Khyenpa (1110–1193). Soon, masters of other schools adopted the system of faithfully guiding and serving their students throughout successive lifetimes, and the lineage of the Dalai Lamas, the Panchen Lamas, and other figures arose, some more public, some tending to be more reclusive. Shall bring deliverance to the world. In the following years, the twenty-nine year old prince from Kapilavastu, a town in what is now Southern Nepal, took to the life of a renunciate mendicant, begging for alms, and practicing meditation under the instruction of the Brahmin anchorite Ārāya Kālāma, a master of the Sākhya school. Soon surpassing his elder, the young seeker left his tutor in order to train under Udraka Rāmaputra in refined and advanced states of meditation that—while intensely enjoyable—did not lead to the final cessation of all sources of suffering. The early years of extreme asceticism took a heavy toll on the emaciated practitioner, who, according to legend, had gradually become so weak that he had become almost skeletal in appearance. In accepting the sweet rice pudding that was offered in good faith by the village girl Sujata, who hailed from a Hamlet across the River of the Bodhi tree, he lost the companionship of his fellow ascetics, who, mistakenly believing that his fervour had waned, abandoned him. Instead, Prince Gautama found that the “Middle Way”—a golden mean between extreme abstention and reckless overindulgence, was much more conducive to both his practice and his health.Vowing that he shall not stir before having awakened to the truth that ends all suffering, he sat under a nearby pipal tree, collected his mind, and after seven weeks of intense meditation, became achieved his purpose in become the Buddha, the “awakened one” who had transcended suffering, together with its sources. For the remaining 45 years of his life, the Buddha taught the way to Nirvāna, the “extinction” of the `fires’ of suffering: the `fire of anger’, `the fire of craving’, and—above all—“extinction” of the fundamental source of anguish, a mistaken perception of a `self’ as an inherently existent, substantial entity. According to traditional lore, the birth of Tsongkhapa Losang Drakpa was predicted by the Buddha, who remarked to his attendant Ānanda that the young boy, who had just approached Him with the present of a crystal rosary, would henceforth mature greatly throughout future lifetimes and eventually be born as one of the greatest propagators to ever turn the wheel of Dharma in the “Land of Snows”. This little boy was to establish monasteries and attain the highest goal. He would be known as Sumatikīrti (tib. Losang Drakpa). These predictions are paralleled by similar prophecies as enunciated by the great Indian Buddhist saint and tantric adept Padmasambhava, who “said that Losang Drakpa would be born in the eastern part of Tibet, near China, that he would be considered to be an emanation of a bodhisattva , and that he would attain the complete enjoyment body of a buddha” (Powers, 1995: 403). Jé Rinpoche (the Precious Lord) was born 1357 in Amdo and ordained under the fourth Karmapa, Rölpä Dorje (1340–1383) at the age of three. His training was extensive and varied, since the young prodigy would engage in oral debate with the great intellects of all and any school or denomination. 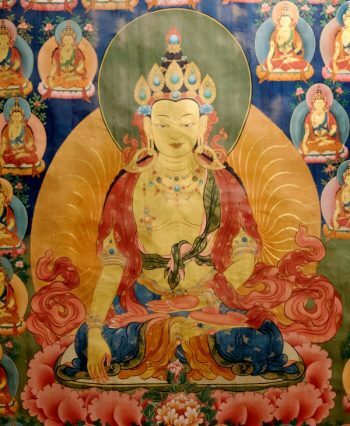 His main teacher would be the Sakya master Rendawa (1349–1412), yet he also received important transmissions from the Kagyu and the Nyingma school, such as the Dzogchen master Namkha Gyaltsen (1326–1401) the siddha Legki Dorje, and others. Particularly close to his heart were the precious teachings of Kadam lineage that originated from the Indian master Atiśa Dīpakara. In his synthetic and eclectic view of the Buddhist traditions, the young master set out to integrate the teachings of sūtra and tantra in a coherent whole, without contradiction between the monastic tradition thoroughly rooted in pure moral conduct on the one hand and the potent practices of tantric yoga on the other. This is clearly mirrored in the seamless transition between the “Great Treatise on the Stages on the path”, which lays the foundation of the Sutrayāna, and the “Great Treatise on the Stages of Mantra”, that extrapolates the correct manner of practicing Tantrayāna. While the young reformer was a great scholar, Lama Tsongkhapa was no less of a tantric master, and in fact, was reported to have had the capacity to converse with Mañjuśrī and receive teachings and guidance from him directly. Traditionally, four of Tsongkhapa’s great deeds are emphasized: (1) the renovation of the Maitreya Statue and its hosting edifice (2) the revitalization and reformation of the monastic tradition In 1409, (3) the installment of the “Great Prayer Festival” that continues to the present day, and finally (4) the founding of Ganden monastery in 1409. Assessing Jé Rinpoche’s unfathomable accomplishments, Thurman (1982: 28) writes in his “Life and Teachings of Tsongkhapa”, that upon “careful consideration of the list of Tsong Khapa’s discourses and teachings, it would also appear that he must have spent his whole life discoursing. Yet from the point of view of his daily practice it seems that he spent his life in meditative retreat. But on reading his literary output, it would seem that he could only have read and composed texts. 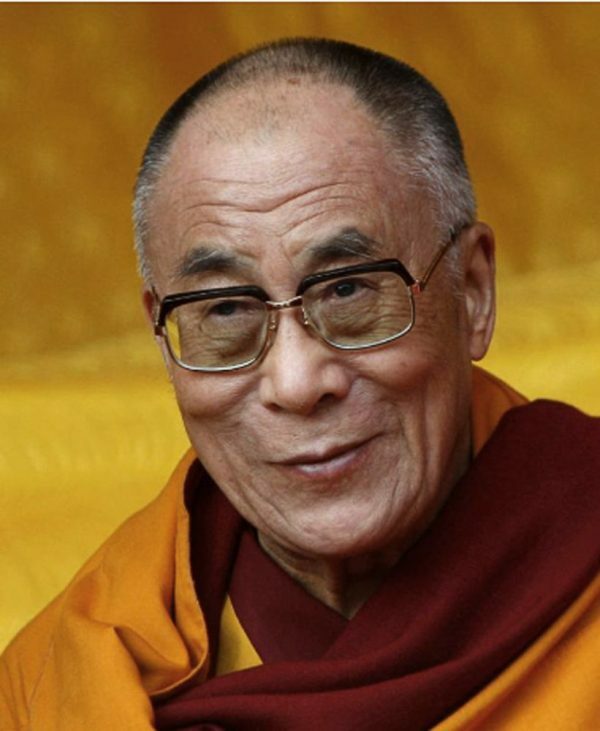 His Holiness the Dalai Lama feels that Je Rinpoche’s greatest feat was to have done all three.” Tsongkhapa’s students comprised a score of of highly realized scholar-practitioners, from amongst which the most famous are the first Dalai Lama (Gendün Drup), the first Paṇchen Lama (Khédrup Jé), and the first Ganden Tripa (Gyaltsab Jé). 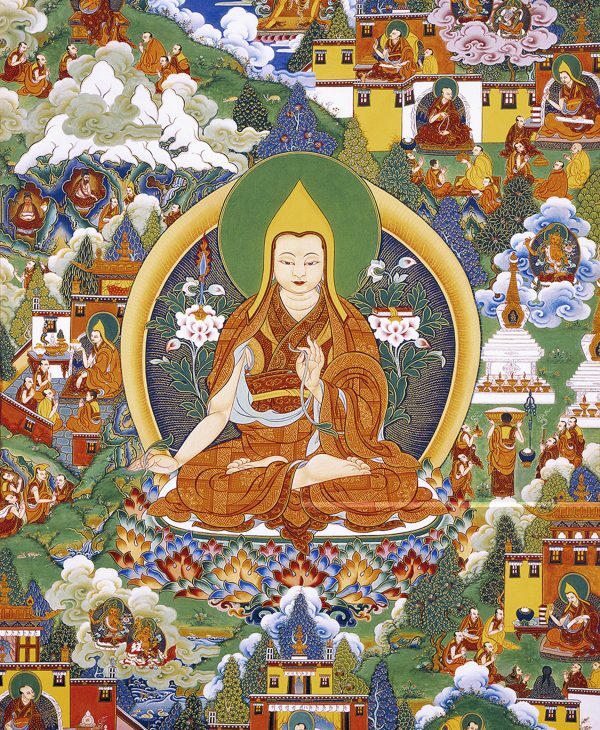 The Lineage of the Dalai Lamas started with Gendün Drup (1391–1478), a direct disciple of Tsongkhapa. Traditional accounts relate that, in fact, the first Dalai Lama was nothing but the 51st incarnation of Avalokiteśvara, the Bodhisattva of compassion, as well as the reincarnation of Dromtönpa, initiator of the Kadam school and Student of Atiśa, who had been the 45th incarnation of Chenrezig. The first Dalai Lama became the first abbot of Ganden monastery, founded Tashilhünpo near Shigatse, and formed a close relationship with the protective Goddess Palden Lhamo (Śrī Devī), the chief protective goddess of Tibet. The “great fifth” Dalai Lama, Ngawang Losang Gyatso, was born in 1617 amidst great political unrest and volatility. However, in reliance on the fortuitous association with Güshri Khan, the Dalai Lama was crowned both temporal and spiritual leader of Tibet in 1642. When the Khan passed away, it was the Dalai Lama’s duty to appoint the Khan’s son Tenzin Dorje as successor to the Mongol throne. Not only did the “great fifth” Dalai Lama reform the political and educational structure of Tibet, he was a prolific scholar, whose collected works span many volumes, and purportedly had auspicious visions throughout his life, some of which were documented in secret diaries. He brough together a fragmented political unit and welcomed other traditions, particularly the Nyingma school, some of whose practices he adopted. The sixth Dalai Lama, Tsangyang Gyatso, born 1682, is fondly remembered in Tibetan collective memory for his poetic, romantic, and touching spirit reflected in his writings, many of which are love-poems. In 1701, a political intrigue wherein Lhasang Khan had the Desi Sangya Gyatso killed, troubled the young incarnation to the extent, that he renounced his monastic vows and took to sauntering in the parks with his companions, and singing drinking songs in the taverns at night. Five years after, he died on the way to China. The thirteenth Dalai Lama, Thubten Gyatso, was born 1876 to a peasants’ household. Surrounded by great spiritual masters, such as Ling Rinpoche Lobsang Lungtok Tenzin Thrinlä and Phurbu Chok, he assumed poticial and spiritual power over Tibet and skilfully navigated her through the taxing times of the “Great Game” that czarist Russia and imperial Britain were playing over who would gain suzerainty over Tibet. He survived both the 1904 Younghousband military “expedition” to Tibet and the Chinese invasion of 1910, as a result of which his authority greatly increased. He modernized and reformed the political and spiritual structures of Tibet before he passed away in 1933. The fourteenth Dalai Lama, Tenzin Gyatso, was born 1935 to a family of farmers, who raised horses, in Taktser village, not far from Kumbum monastery. Reting Rinpoche, Kewtsang Rinpoche and, particularly, the Paṇchen Lama were instrumental in His recognition. Two years after, the current Dalai Lama was escorted with great fanfare, from Kumbum monastery to Lhasa, where he was enthroned in 1950, aged 15, with the Chinese Army building up on the borders. In September 1954, he met the Chinese leader together with the Paṇchen Lama, leaving for India in 1959 at the outset of the Tibetan uprising. Ever since, the Nobel Peace prize laureate of 1989 has been tirelessly working for the promotion of human values, religious harmony, and the preservation of Tibetan culture, and continues to do so with undiminished fervour, to the present day.